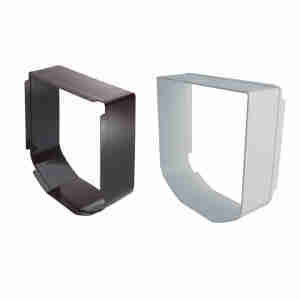 SureFlap tunnel extenders can be used to create a longer approach tunnel to the SureFlap Microchip Cat Flap, SureFlap DualScan Microchip Cat Flap and the SureFlap Connect Cat Flap. when it is installed in a wall. The SureFlap tunnel extender fits snugly onto the tunnel of the SureFlap Microchip Cat Flap and multiple extenders can be stacked together to form a tunnel of any length. The tunnel of the SureFlap Microchip Cat Flap is 70mm (2.75”) long and each tunnel extender adds 50mm (2“) to the length of the cat flap’s tunnel. We're sorry but there are no reviews of this product.